The subjects of many artworks and design range may range from various themes and topics be it people, love, events, objects and so on. We sure cannot forget the use of food in illustrations. They are as equal and nourishing as the previously mentioned. Food is also interpreted differently through various art styles and art direction. 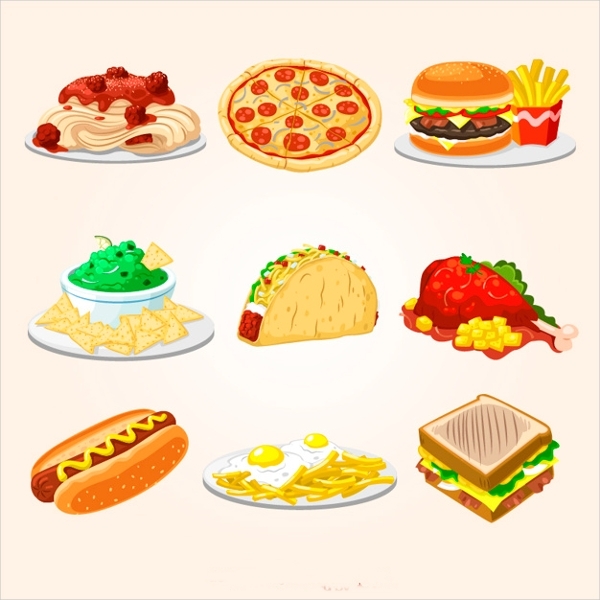 Take a short trip from the endless search of nutriments with our heap of food illustrations. The list down below features different art and design styles to render an assortment of vegetables, entrees, and desserts. 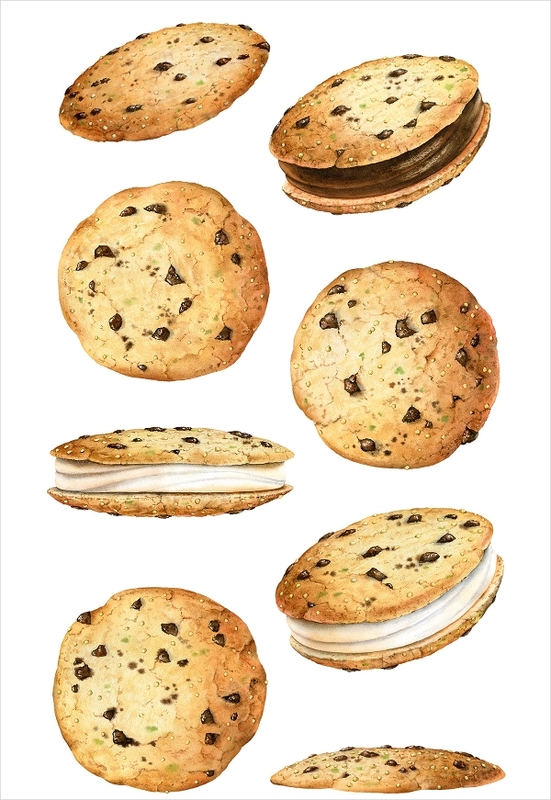 For more visuals on food, you may go through our collection of food drawings. The light wash and simple rendering of the olives bring about a natural appearance to the illustration. With the use of dark greens as well as a zesty green hue demonstrates the emulation of natural light. The Olive in Watercolor would make a great reference for illustration and color. You may also apply them to any design projects at hand. The Olive in Watercolor would make a great reference for illustration and color. You may also apply them to any design projects at hand. The Simple Citrus Salad Illustration is the creation of Anne Shen which follows the basics of color theory be it the use of a monochromatic color palette and a layered composition. In this illustration, the bigger elements are used as backgrounds which are filled in with a lighter color to let them appear farther to allow the rest of the elements to appear much closer and near. With the sense of dynamic movement captures an activity despite being rendered in a two-dimensional perspective, The use of shadows creates dimension to this light and nourishing illustration. As well as the application of warm colors such as gold, red, orange and violet balances out the dominating use of coal or receding colors. 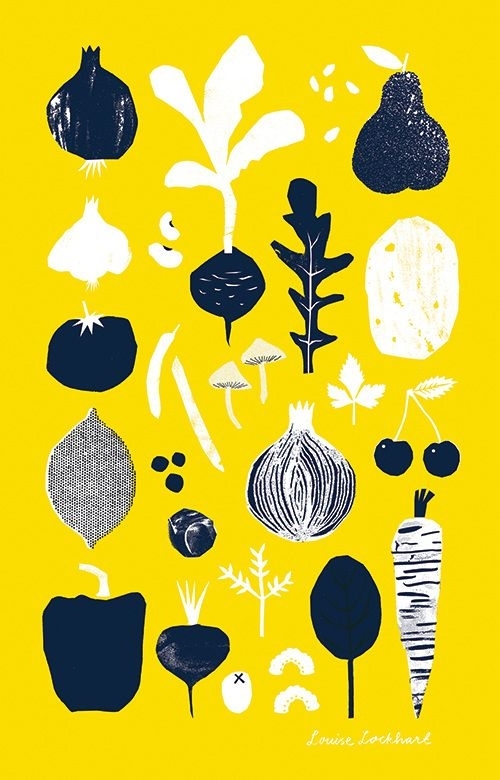 The Vegetables and Fruits Illustration is reminiscent of a printmaking output due to its use of rough texture. Which gives dimension and details to the exterior and it works perfectly since being laid out in a flat design. The color scheme also seems to compliment the roughness and less-detailed design elements. 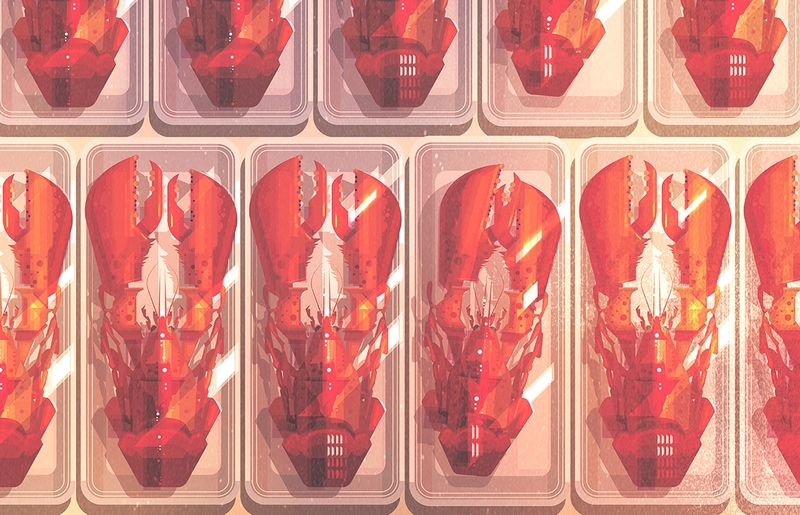 This Japanese Food Illustration is designed by James Gilleard. 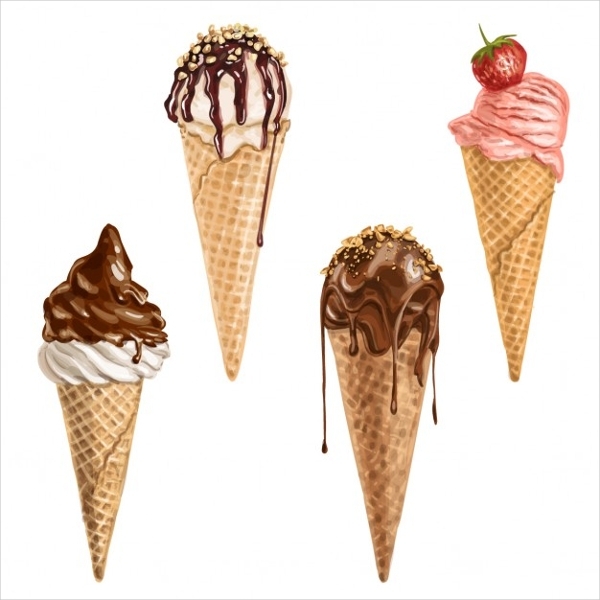 This design is treated in a flat lay perspective which is a mainstay when it comes to food illustration and food photography and it is well executed in this illustration. The design has a seamless contrast with the subtlety of the color palette and an addition of geometric shapes to give the design an edge. This food illustration makes great use as a reference to artworks and design. To take note of its color palette, perspective, use of lighting, and interpretation of Japanese and other foreign food. What is in a paella and why does it taste that good? Well, it is a known fact that it has to do with the love for cooking and the selection of mighty fine ingredients for a gastronomic experience. 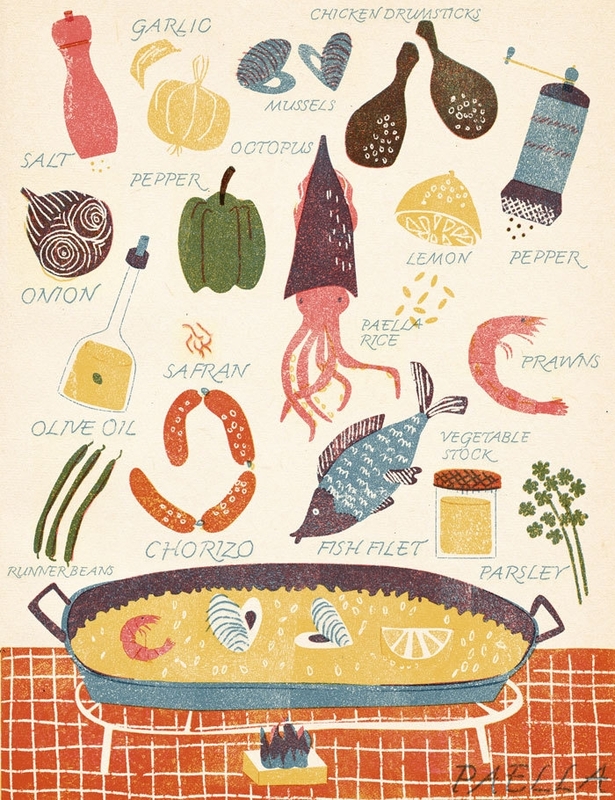 In this food illustration, showcased the variety of ingredients gathered up to create the paella dish. 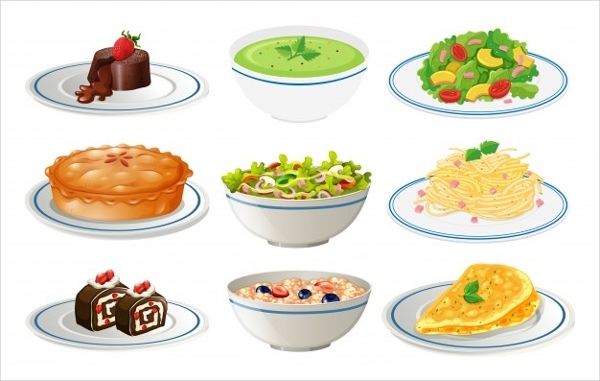 The food illustration still boasts a use of perspective but it still demonstrates a flat design. It is a fun and lighthearted artwork given its less-detailed rendering and texture to bring about dimension and character. 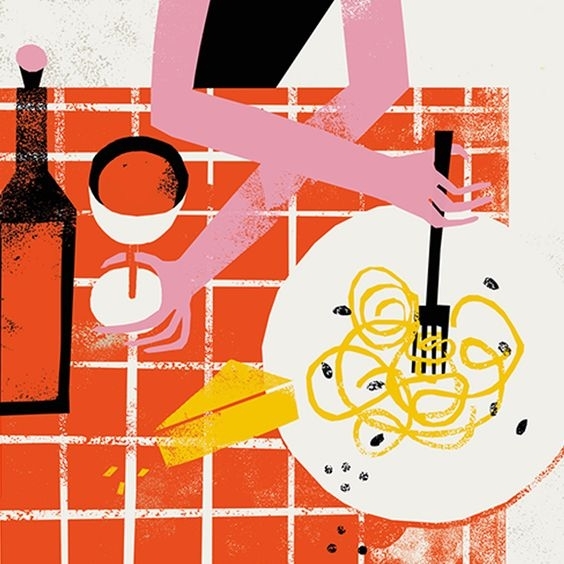 The Pasta Heaven Illustration made by Nanna Prieler is another food illustration set in a flat lay perspective. The dominating use of red goes back to the basics of color theory; wherein the color red enhances the human metabolism. But the use of other warm colors and neutrals balances out the intense color of red. The application of the spongey texture exudes roughness and dimension. On the flipside, the form of the subject gives sophistication. 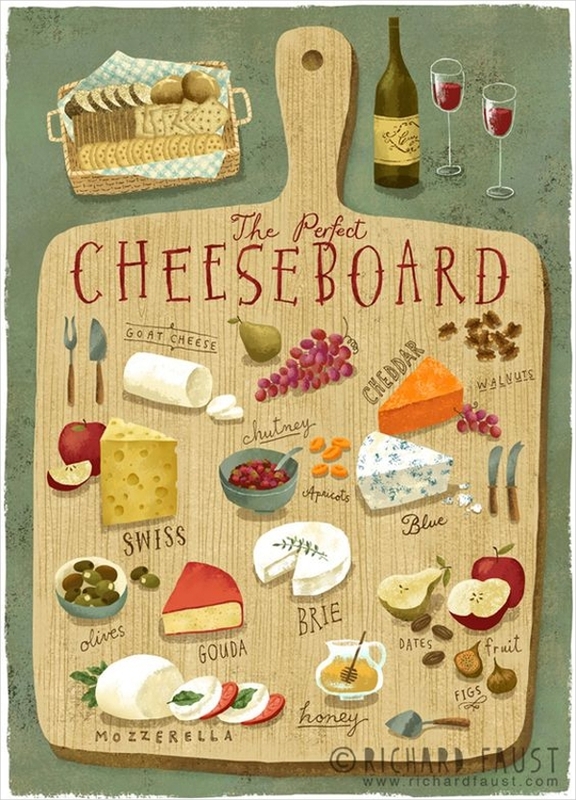 This food illustration hits the nail by placing the pairings of cheese such as wine, crackers, biscuits and so on. But it also interprets the variety of cheese as close to their real forms. The composition of the design elements allows viewers to navigate and identify the cheeses and be introduced by other types of food and cheese pairings. How comforting would it be to bathe in syrup on a waffle or sleep like a baby on a fluffy piece of sliced bread? The “Comfort Food” A Series of Food Illustrations created by Monica Ramos, is imaginative of another otherworldly dimension and is a visual storytelling of how comforting it is to grab a bite on a waffle, bread, and cereal. The use of lights gives the set of donuts a glazed look which helps in bringing out a thick and creamy consistency of the donuts. As well as creating a realistic appearance of the donuts. It also demonstrates an imperfect exterior with the irregular shapes of the donuts. Donuts are used as subjects to an array of artworks and design. In some cases, you happen to see them brand identity to many businesses and companies. Skim through our list of donut logo designs for inspirations for your next branding project. 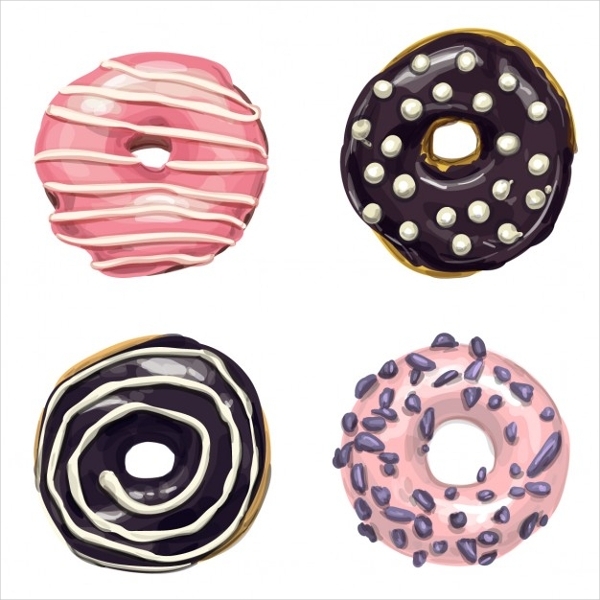 Similar to the Sweet & Mouthwatering Donuts, this realistic set of food illustration ignites cravings with its dripping toppings and a simple selection of ice cream flavors. The use of lighting allows the toppings to appear to have a creamy and thick consistency which it gives more drama in how it drips. If you happen to prefer ice cream cups and tubs over cones, you may freely download the PSD icecream mockups to incorporate for your packaging and branding. As well as utilization for design prototypes and for future references. Crisp golden brown cookies with plenty of chocolate chips and toppings to munch and soft filling to complete the dessert experience. This food illustration was created for a client, Drawn, an Advertising agency in Oregon, USA. Which is intended for packaging and advertising a vegan coconut based cookies as well as ice cream cookie sandwiches. Speaking of packaging, to cut your search for dessert packaging, we have gathered a heap of cupcake packaging designs and ideas. The list may be used for design projects, brand identity, packaging prototypes and so on. 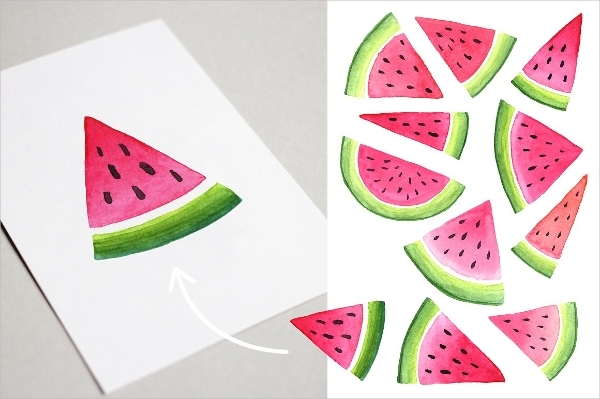 This watermelon illustration is treated with a gradient and lifted washes in its watercolor application which gives a light and fresh appearance to the sliced subjects. It also comes along with one seamless pattern and eleven other elements in both transparent and white backgrounds. You don’t have to worry since this set is packed with high-resolution of 300dpi files. Speaking of patterns, we have more offerings we’re glad to share with you. We have gathered 25+ fruit patterns that will be of great use for backgrounds, design reference, physical print and so on. It is best to finish the meal with a nourishing and filling fruit salad. This variety of fruits are created as if to appear in a mixed media design with the fruits designed in a paper texture and with the evident medium heavy paint strokes. 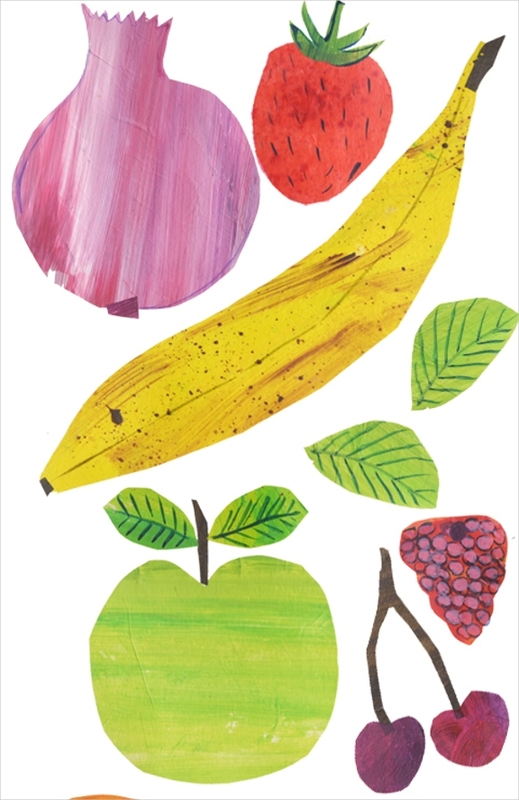 You may also select more variety of fruits in our heap of fruit illustrations. All of which are rendered on different art and design styles. 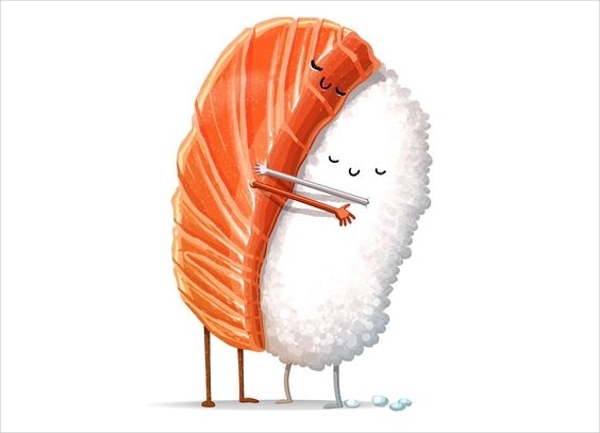 In our last food illustration on the list, a depiction of the harmonious pairing of two essential ingredients in crafting a well loved dish, sushi. Both of the design elements receive good lighting which gives one a shiny coat and a full looking exterior. You may apply this food illustration onto future or upcoming design projects and as future references for character design.